Up until now, over 75% of waste electrical equipment in the UK has been landfilled but we all have a legal responsibility to change that. 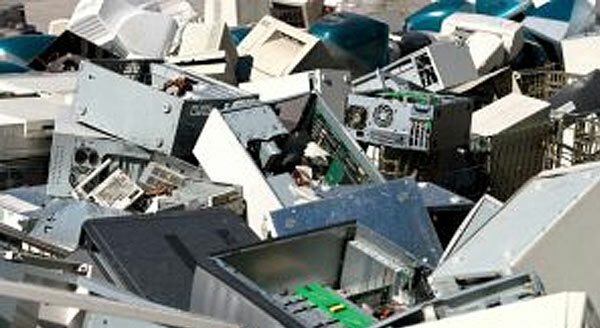 Also known as e-waste, discarded computer equipment comprises monitors, printers, hard drives and circuit boards. Such items should on no account be thrown out with your office rubbish because they contain toxic substances, and are effectively hazardous waste. E-waste often ends up in the developing world. Just one computer can contain up to 2kg of lead, and the complex mixture of materials make PCs very difficult to recycle. Recycling saves energy, natural resources and helps reduce your impact on the environment. Make a difference and reduce your carbon footprint by doing your best to recycle more and more of your old and unwanted electrical equipment. RCS understands your business and that you may not have the time or resource to carry out an inventory of equipment. RCS will be happy to visit your site and facilitate an asset report on your behalf. We are Environment Agency Registered and fully authorised as a Waste Carrier. We have a Waste Management License and Authorised Treatment Facility. Our recycling services are also full GDPR compliant. We can dispose of any redundant electrical equipment, fluorescent tubes, white goods, batteries, furniture – you name it, we can recycle it!